CAGLIARI, Italy (August 30, 2018) - The final stage of the 2018 Melges 32 World League officially got underway today on the spectacular regatta race course at the foot of Sella del Diavolo, the heart of Cagliari. The conditions were perfect with fourteen knots of breeze at 200 degrees. Two races were completed and the great balance that reigns in this One Design Class prevailed. Organized by Yacht Club Cagliari in collaboration with Melges Europe, the winner of opening day on countback goes to Germany's Fritz Homann at the helm of WILMA (Nico Celon, tactician). Thanks to a strong 2-4 daily scoreline, World Champion Pavel Kuznetsov racing TAVATUY (Evgeny Neugodnikov, tactician) sits in second place, sharing equal points with Homann. "It's not a bad idea to be in front of everyone. It really matters very little or nothing at the moment, because the real classification will matter only on Saturday night," said Homann. "But we are satisfied for now with how we raced. We still have areas we need to improve upon. All we can do is try and stay focused, and continue with the same rhythm that we have. 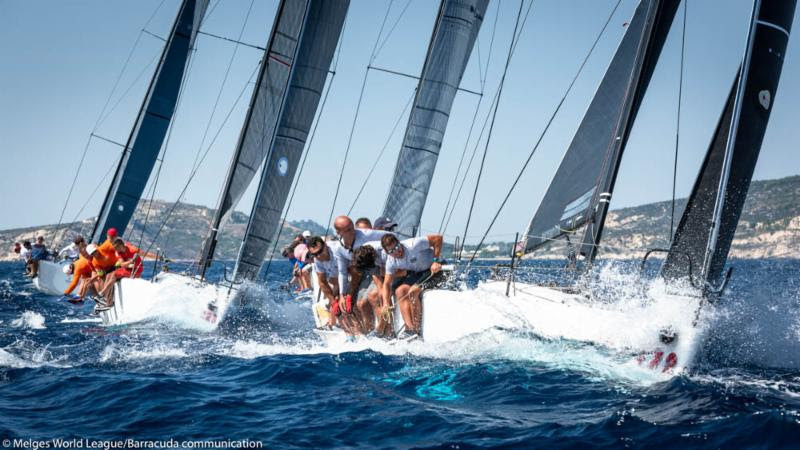 We know that the Melges 32 can be very particular, as there are many good teams racing. Everything can change so fast, even for us in a moment." Right behind the top two are the first of the Italians, including top-ranked Matteo Balestrero sailing GIOGI (Branko Brcin, tactician). Balestrero took advantage of great opportunity today as he clearly out performed his direct ranking opponent - Vincenzo Onorato's MASCALZONE LATINO, who finished the day in eighth. At the intersection of these results, there is a possible pre-written script for the next two days: Balestrero must maintain a minimum margin to try and control every situation and his opponents. Onorato and his team are known for coming back strong and can induce a decisive overtaking at any time. The same applies for 2017 Melges 32 World League Champion Giangiacomo Serena di Lapigio at the helm of G.SPOT. The next two days will provide him his best chances for overtaking either Balstrero or Onorato. Martin Reintjes and tactician Gabriele Benussi aboard CAPIRINHA currently lead the Corinthian Division, happily seated fifth overall. The Melges World League is supported by Moby, Tirrenia, Helly Hansen, Garmin Marine, North Sails, Toremar, Norda, Lavazza, Rigoni di Asiago and Melges Europe.